For the general concept of species moving around, see migration. For people moving data around see data migration. Human migration means any movement by humans from one locality to another (migration), often over long distances or in large groups. Humans are known to have migrated extensively throughout history and prehistory. International migration is the movement of people between countries. Some leave their home countries voluntarily and some are forced to leave. They hope to find a job, better climates, access to hospitals, schools and entertainment. Some want to be with friends and relatives but others are forced to leave the country because of religious and political persecution, wars, racial discrimination, famine, or natural disasters. These people are refugees, they move to other countries hoping to find help and asylum. Most refugees are illegal immigrants and more than half are children and women. They live in extreme poverty, lacking food, shelter, clothing, education and medical care. Rural-urban migration is the movement from country areas to towns and cities. There are many reasons why people leave the countryside. In some areas there is overpopulation, resulting from high birth rates and starvation. Mechanization has caused a reduction in jobs available in the countryside. Farming is hard work with long hours and little pay. In developing countries a lack of money means a lack of machinery. Natural disasters such as droughts, hurricanes, floods and volcanic eruptions destroy villages and crops. There is a lack of services like schools and hospitals in the countryside. People move to the city because they are looking for better paid jobs and expect to be housed more comfortably and to have a higher quality of life. They have a better chance of services such as schools, medical treatment and entertainment. People are often also attracted by the advantages of a cosmopolitan lifestyle such as shops, restaurants, theatres and nightlife. Reality is very different. Though as many new arrivals to the city are unlikely to have much money, they will be unable to buy or rent a house, even if one was available. They will probably have to make a temporary shelter using cheap or wasted materials. A lot of migrant workers’ children are also struggling to get a decent education. In the new country they often are not integrated and are treated like an underclass. But they are needed in the cities even if the local population doesn’t like immigrants because they compete for the same jobs. More people means more traffic and more crime. But in fact they help to build up cities, provide cheap labour, invest money, buy products and services, pay tax and help companies compete. The government should support immigrants because they are very important for the economy of a country. Scheme of Indo-European migrations from ca. 4000 to 1000 BC according to the Kurgan hypothesis. 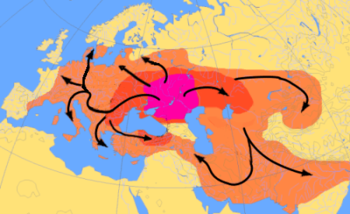 The purple area corresponds to the assumed Urheimat (Samara culture, Sredny Stog culture). The red area corresponds to the area which may have been settled by Indo-European-speaking peoples up to ca. 2500 BC; the orange area to 1000 BC. The movement of populations in modern times has continued under the form of both voluntary migration within one's region, country, or beyond, and involuntary migration (which includes slave trade, Trafficking in human beings and ethnic cleansing). The people who migrate are called migrants, or, more specifically, emigrants, immigrants or settlers, depending on historical setting, circumstance and perspective. This page was last changed on 6 November 2013, at 04:06.